Exactly 22 years ago today, Cool Breeze and I were getting married. It was the perfect day - not a cloud in the sky, seventy degrees....and WE. WERE. SKINNY. CB wore the #22 football jersey in high school. The photo below shows him in action:) When we decided to get married, we perused the 1986 calendar in search of the perfect date. As luck would have it, there was a Saturday the 22nd.....in November. Not my first choice for wedding months, but it had to be a sign! The only glitch in the day came in the form of static cling. It was hardly noticeable at first, but before long all of the bridesmaid's dresses were creeping up the back of their crinolines!!! Thank goodness for Static Guard. Stop laughing. You KNOW crinolines were HAWT in the '80's. This photo features the newlyweds and CB's grandmother. Take a moment to check out the train on that wedding dress. I'm still trying to figure out how I was able to wear a garment that weighed more than I did. I have no idea what the next 22 years will hold for us, but I'm excited about continuing this journey. Happy Anniversary Honey!! I love you. Awwww....Happy Anniversary!! 22 to #22 on the 22nd - go do something REALLY special to celebrate!! Happy Anniversary! Congrats on 22 great years! Happy Anniversary to both of you! You were both so cute and adorable! That dress is beautiful, and I love trains. Many more years of wedded bliss! Hope the next 22 years are as wonderful as the last 22 have been. You are so fortunate to have such a successful marriage. 22 years is an eternity these days. Congratulations to both of you. I hope you're going away to celebrate. You deserve it. Love the picture and I recognize that heavy wedding dress...mine looked the same except my shoulders were poofier. All these are great accomplishments! But, being happily married for 12 years is your biggest blessing. A very happy anniversary to the both of you! Happy Anniversary! I hope the two of you are going to do something special to mark the occasion! How wonderful. I love hearing great marriage stories....yours is fantastic. The dress was a big large...yes, it must have outweighed you. That is a sign of the times!! Happy anniversary. I hope you have lovely day and many more wonderful years!!! What a beautiful couple!! And that dress is gorgeous....ALL OF IT...it just goes on and on and on lol...I have no clue how you even moved! Congrats on 22 years...that is no easy feat! I hope you have many many many more! Happy Anniversary!!! Sounds like a wonderful 22 years! And you were such a pretty bride. Isn't it fun to look back on all you have done together?! I love the days when we lived in a one bedroom apartment. But now with the baby, these are the best times...not as romantic...but still the best!! This was a beautiful post! I am so happy for you. I think marriage is a beautiful thing. A growing thing : ) but a beautiful thing. It has been a big adjustment for us, but I am loving it. I am glad you have had 22 years together. So special! Thanks baby for the great post. I love you too and happy 22nd. Just in case anyone was wondering, that football did not hit me the face. In fact, it was rebounding off of my shoulder pad (should have used my hands), but what the picture does not show is the defender barreling down on me from behind about to clean my clock (which he did), but I managed to hang on and stay in bounds too. 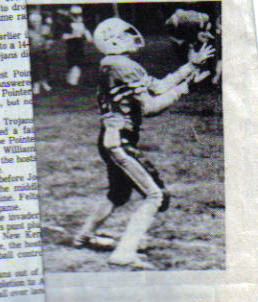 That was the game against New Kent (our arch rivals) from my senior year. We lost, but I think I had a pretty good game (One interception, a few cathes, some decent tackles, etc.) Ahhh, the memories. 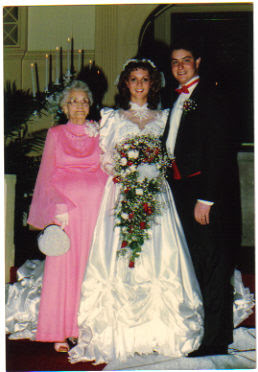 ... and the dress ... i remember now why you couldn't keep up with me walking (I mean running) down the aisle. We have had a wonderful 22 (26)years together. I can't wait to see what the next will bring. Happy, happy day to you both. Don't you love having a happy marriage! As for kitchen blunders: I have no idea what you are talking about with the spoon. I do, however, remember having my child's teacher over last year and tasting her drink RIGHT IN FRONT OF HER and then serving it to her. She never said a word and drank that thing right down. Happy Anniversary Sunshine! May the next 22 years be even more fun! By the way, you need to tell the Mr. there to do that football pose for you in the kitchen. Then when he does, walk over an "goose" him! congratulations we;ve been married 21 years and you were a lovely bride!! H Anny to you. We were married in '85, and I had a big ol' train, too. You really were a lovely bride. Congrats to you both. Ahhhhhh! I LOVE that you have been married that long! We're creeping up on 20 years ourselves and the next 20 are looking bright! Congratulations. Time flies, doesn't it. A fine wedding, indeed. Did I miss a house somewhere? I thought you only built one.